EIZO today announced the new DuraVision DX0211-IP – EIZO’s first IP decoding box ideal for video walls and multi-monitor environments in security & surveillance. The DuraVision DX0211-IP brings EIZO’s innovative decoding technology from its unique IP decoding monitors (DuraVision FDF2304W-IP and FDF4627W-IP) to an external box format. It decodes multiple feeds from IP cameras that display video in real time. It can be used with varying monitor sizes and resolutions, making it ideal for video walls and multi-monitor environments. EIZO’s IP decoding box is an integrated solution that connects directly to the switch connecting IP cameras. It does not require a PC, software, or other hardware to operate, greatly simplifying installation and saving on time and labor costs. This also eliminates several potential points of failure typical of a conventional setup by heavily reducing the amount of equipment needed to manage sensitive visual data. Equipped with two HDMI outputs, the DuraVision DX0211-IP supports 4K UHD resolution (3840 x 2160) on up to two monitors simultaneously. It can decode and compress H.265, H.264, and MJPEG codecs while maintaining high framerates, even when streaming high-resolution video. 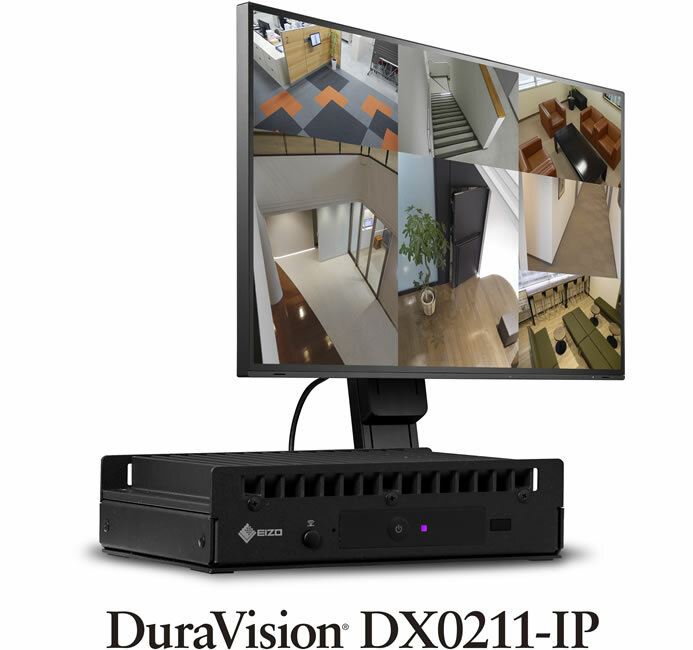 Up to 64 IP cameras can be registered to the DuraVision DX0211-IP, including 4K cameras. With the user-friendly web UI, users can easily adjust the layout of the video streams, displaying up to 32 screens per monitor. In addition, custom layout allows users to merge or split individual windows to fulfill individual viewing needs.